Even though I wrote this a few days ago, I got pissed off again when I was translating this. Two weeks ago I decided to get a new battery for my third-get iPod since the battery gave out a long time ago. This would be the second time I change it and judging by this situation, the last before I buy a more recent model of iPod. The first time I changed it was after I found this place called D’Newton. This store prides itself in being the only authorized distributor of Apple products in the whole northwest of the country. This was as long as you could actually get to it, given they moved from Zona Río to Plaza Mundo Divertido and didn’t update the store’s website. The only way you could find out about their new location was by a simple sheet of paper taped to the door of their old location. When I went to their new location they had the right battery in existence so I bought it there and then. Changed the battery without too much problem and that was that for a long while. This time around I went to the store and they didn’t have the battery in existence… but it could be ordered. I paid the required amount and was told they would have the battery next week. That next week I was told they still didn’t have it… but they would have it next week. On Friday I called them up and was told all their providers had the wrong type of battery in stock and would have to wait at least another week. 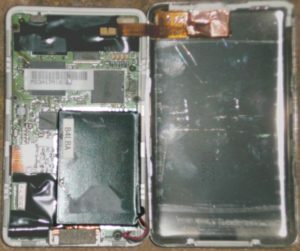 I was also told they had gotten a third-gen iPod for repairs and could sell me that iPod’s battery at a reduced cost and reimburse me the difference in cash. So I went to the store… and was unpleasantly surprised when told they did have the new battery in stock but I would have to leave my iPod in for the night. I explained to the guy in charge I was told an iPod had been turned in for repairs and I was offered its battery at a reduced price. This guy once again told me I would have to leave my iPod for the night because the technician had ‘lots of work” and it wouldn’t be ready right then. 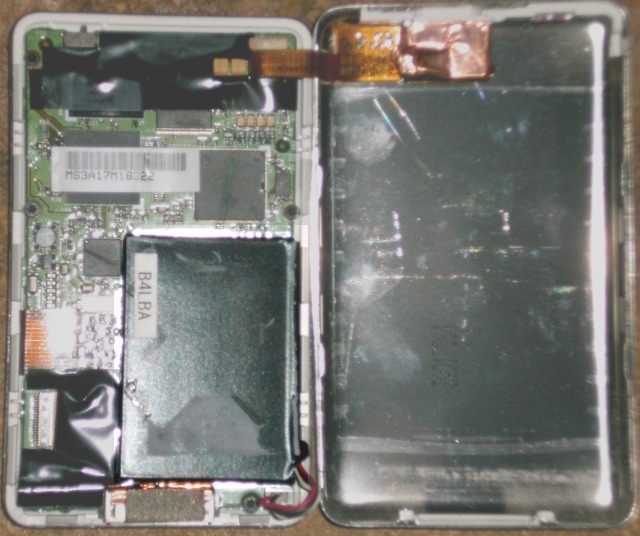 This is where I got annoyed… changing an iPod’s battery doesn’t take longer than 10 minutes and doesn’t require any parts to be soldered. And I’m not taking into account that they would have charged me for having the technician change the battery. By now I’m showing my annoyance. I asked if they had the battery available so I could take it home with me. The clerk went to the technician and came back with the battery. He gave it to me along with my reimbursement and went home. I get home, take my iPod apart… and turns out the damn battery isn’t the correct one. It’s too wide and won’t fit in the designated space inside the iPod. 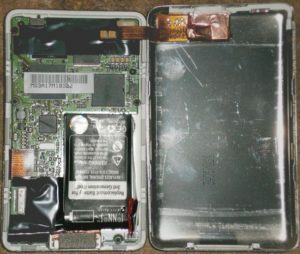 The old battery is narrower and even leaves some empty space. 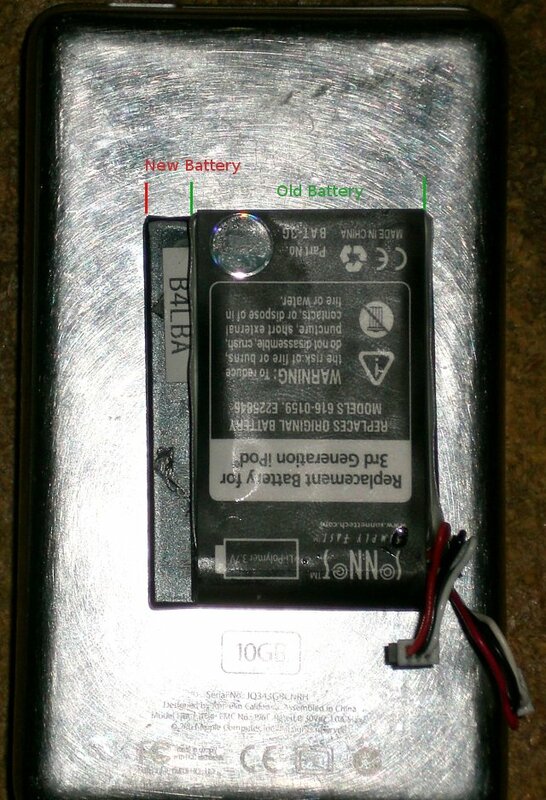 Here you can see how both batteries compare to each other, with the ‘new’ battery on top of the current battery. Truth be told, I’m extremely disappointed with the level of service this store has given me. I’ll go later in the week to see what can be done about this; hopefully this mistake will be corrected without too many issues. If anyone from Apple reads this, please take care who gets the privilege of being an “Authorized Distributor.” People who try to screw you at every turn, stores that close on Sundays — the only free day for many — and companies who believe themselves a government agency (or AT&T, Verizon) by giving you the runaround don’t really deserve the title. I’ve gotten better service out in a street stall. Those guys will even tell you where they are on a determined day to keep you as a customer. You don’t want to walk the streets following the guy? At the nearest tianguis surely there is a stall that can help you get what you want.